Prominent & Leading Service Provider from New Delhi, we offer led fabric light box, fabric light box, led light aluminum box, crystal light boxes, translite printing service and led fabric light box display. Latest trend in LED Light Box Display is UV Printed Backlit Fabric. 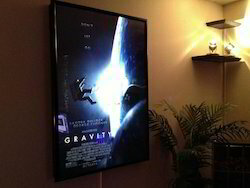 UV Printed Backlit Fabric is an eco friendly way of manufacturing Light Boxes, where there is no plastic sheets used. The image is much more enhanced than PVC or Plastic Sheets, giving a enhanced look to the display and the product. With the installation of our latest state of the art UV Roll to Roll Printer we have become one of the leading supplier of UV Printed Backlit Fabric in Delhi. 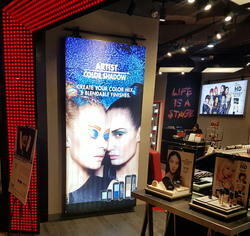 LED Fabric Light Box Display Signage is the latest form of Display used for instore branding these days. Fabric is UV Printed and stitched with silicone strips and stretched in aluminum profiles with LED. 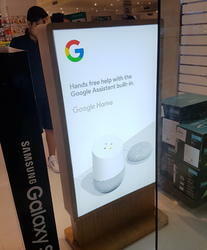 It gives a premium look to the store display unit. Owing to our technological adeptness, we are at the forefront of offering best quality LED Light Aluminum Box. These light boxes are designed with standoffs that can be unscrewed easily to change the graphic. Owing to its convenient design these light boxes are best suited for food joints, schools, hospitals and shopping malls. Developed using rust proof aluminum material the high-quality light boxes are delivered in sturdy packaging. We have high specialization in offering supreme quality Crystal Light Boxes. Featuring an elegance and sheen from within, these ultra slim light boxes are best suited for creating a center of attention at public places. The graphics will glow from the light boxes which are developed using the LED luminous panels. 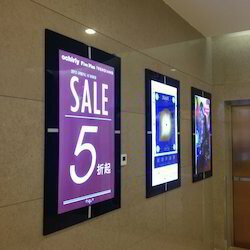 Designed under strict quality supervision, these light boxes are accessible at a leading price. We have a complete devout in offering highly demanded Translite Printing Service. A pool of talented professionals is conducting rigorous research to help our clients promote their company logos or events by rendering the cost effective translate printing service. We use the best quality material and utilize the quality tested inks to print a wide variety of boards, banners and fabrics. LED Fabric Light Box Fabric Light Boxes are made by Aluminum Extrusion Sections combined together and the fabric is UV Printed and stitched with a silicone edge. This edge is fitted into the aluminum section to give the print a frameless look. Silicone Edge Graphics / SEG is the other name for fabric light box. We are one of the leading manufacturers of Fabric Light Box / SEG in Delhi. Contact us for more information. 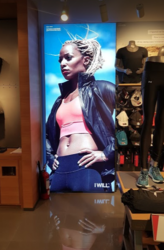 LED Fabric Light Box Display UV Printed Backlit Fabric Light Box is ideal to attract in-shop customers. Fabric Light Box is an ideal tool to bring a dynamic edge to your brand and promote your business. 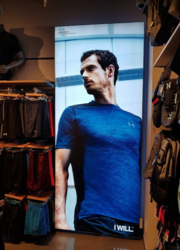 Fabric Light Box enhances the retail environment and point of sale displays. 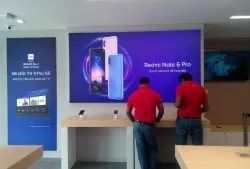 We are one of the leading manufacturers of LED Fabric Light Box in Delhi and with latest UV Printing technologies deliver razor sharp prints stretched to aluminum profiles and illuminated with LED's. Contact us to get a quote and more information. UV Printed Fabric Light Box Display We use UV Printing Machines to print fabric for light box. UV-printers employs the latest UV curing technology to explore unlimited media application which are not possible for conventional digital printing. 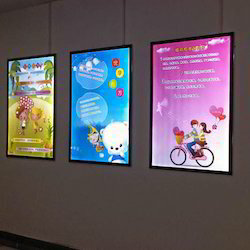 The depth of UV printing is far superior than other regular printers UV Printing is also highly recommended form of printing for our specialized LED Light Box. This combination creates a phenomenal effect that you can't find else where. So the Fabric Light Box printed with UV Technology is unmatched in quality. We are one of the leading supplier of Fabric Light Box in Delhi. Contact us to get more details.